The holiday season is nearly in full swing with Thanksgiving around the corner followed closely by Chanukah, Christmas, Kwanzaa, New Year’s and more! With the chilly weather, it’s time to change out the summer clothes for the winter clothes. Â And the chilly weather means it is a great time to bring warm colors into your home. Â Here are some ideas to bring the holiday spirit into your home:A beautiful wreath from the Farmer’s Market like I found last week for $25 is a great way to welcome guest. 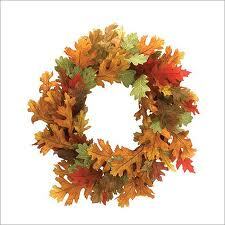 Mine has deep color oranges, reds, and browns for colors to carry us through the season (similar to wreath shown above). Â The wreath will also keep for years to come making it a relatively inexpensive investment. 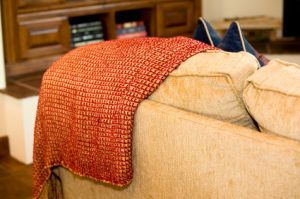 A simple yet elegant way to warm up your living room for the winter season is Â with some throw blankets, which add rich touches of color and warmth when you wrap up in them. Pottery Barn, Williams-Sonoma, Crate and Barrel, and Restoration Hardware offer elegant options for adding bits of holiday spirit to your home. Â Boutiques in small downtown areas often have seasonal offerings plus it makes for a fun afternoon in your local area. For more cost conscious ideas, try stores like Michael’s,Â Target orÂ TJ MAXX Home Goods for items that won’t break the bank to add a touches of color to your home. How do you plan to get into the holiday spirit this season?